Water, Cetearyl Alcohol, Ppg 15 Stearyl Ether, Glycolic Acid, Glycerin, Polysorbate 60, Steareth 21, C12 15 Alkyl Lactate, Cetyl Lactate, Cocamidopropyl Pg Dimonium Chloride Phosphate, Potassium Cetyl Phosphate, Disodium Edta, Xanthan Gum, Sodium Hydroxide, Panthenol, Cucumis Sativa (Cucumber) Fruit Extract, Camellia Oleifera (Green Tea) Leaf Extract, Butylene Glycol, Menthol, Benzalkonium Chloride Solution, Yellow 5, Green 5, Blue 1 (ci 42090), Fragrance. Quoted from 'debbouzane': "this stuff feels good on the skin, and it doesnt leave my skin dry, and it smells fantastic! but, it doesnt really do anything for my acne or redness, just leaves my skin feeling good." These are my exact thoughts on this product. I will not be re-purchasing this product, but i'm still going to be using it until this 1 tube is empty since it was one of the 'pricier' face washes and i would hate to see it go to waste. This product was recommended on a blog as "the top 10 best acne face washes" but I'd rate it as just another face wash. I have light acne (some cysts, whiteheads, blackheads, lingering hyperpigmentation). I began getting mild acne around the age of 20. This was one of the first brands I tried and I swore by it for about a year. It did not clear me up entirely but something close to. Around this time I went off of birth control and broke out completely. It seemed like nothing was working. I wouldn't blame this product; rather, my hormones were out of whack. Nothing assisted my face with clearing up at that time. My acne became moderate for about 6 months. I stopped using this wash because I fell into the foundation trap - you know, when your skin feels ugly so you start wearing heaps of make up to hide it, giving yourself more acne in the process. As a result of my newfound make up dependency, it never felt like my skin was truly "clean" using a cream wash considering how much make up I slather on. I switched to a variety of different foamy, higher end brands in an attempt to clean my face more deeply. The thing is- I loved how smooth and clean smelling this product was. More importantly, it necessitated gentle contact with my face as opposed to the usual rubbing with my palms. It is soft and luxurious and does not leave my skin feeling taut or abused. I am now at the point (2years later) where my hormones have likely relaxed and my acne has somewhat improved. I get four or five pimples at a time, some cysts. They last a few days, maybe a week and a half. I have a nagging feeling that wearing too much make up/drinking too much coffee has taken a toll on my face and I am wanting to pull back. Fortunately, I can return to this beloved wash of mine. I am hoping to experience similar results. Will report back. this stuff feels good on the skin, and it doesnt leave my skin dry, and it smells fantastic! but, it doesnt really do anything for my acne or redness, just leaves my skin feeling good. 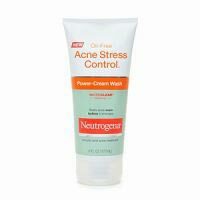 gentle smells nice doesn't help clear acne does not prevent future acne I have been using this for years. It doesnt really do anything for me unfortunatly. I have oily skin at my t-zone and it tends to be sensitive. This did not make my breakouts worse but hasn't made them better either. - Cleared *previous* acne - Minimises bumps and redness of acne - Feels good on the skin - very refreshing - Can dry your skin - Can make your skin flaky (if it does get flaky I use an exfoliator so all is good) - I still get new pimples (BUT really less) I love this face wash! Firstly, I have had moderate acne on forehead with oily forehead. I used to have a forehead with 20+ pimples. Now my skin is almost bumpless and you mainly see scars. I use this twice a day - I leave it on my face for 1minute and then wash it off. I use this wash with the cream Brevoxyl 4 (this worked well too). HOWEVER, my skin dried up because of both of the products. An advice is to use a 'good moisturiser' like Aveeno Daily Moisturising Lotion - it is really good. The little granules help with dry skin helps stop current acne lasts a while doesn't help with forming acne I'm on a swim team and swim daily, so my skin gets VERY DRY from the chlorine. I'm talking coming off in flakes all around my mouth, chin, t zone, and forehead. it's horrible. The granules on this cleanser definitely help with this (even if you're just rubbing gently it works). I've been using it for over a year because while it does not "stop acne even before it emerges," it definitely helps with acne already on your face. I would reccomend it. I have been using this for about a year and it is great. My best friend has moderately severe acne. Every time I would come over she would ask me HOW IS YOUR FACE SO CLEAR. I recommended her this stuff because she was freaking out cause she starts high school in 2 days. We went and bought it for the INSANE cheap price. She started using it 2 days ago and she just texted me and told me her acne was gone. I RECOMMEND IT FOR ANYONE WHO HAS ACNE.. FROM LIGHT ACNE TO SEVERE. Easy to use Washes off easily Helped clear most of my acne on my forehead Didn't clear up everything completely but helped a lot! I used this because I know that I break out from stress but I also break out during my period and when i'm stressed. I do still have some acne which i believe comes from oil and dirt clogging my pores. but this really helped a lot. My forehead had bumps on it and it cleared up a lot, cleared up the appearence of my acne. I do, however, still have some acne on my chin and between my forehead but it cleared it up everywhere else like on the side of my face and forehead. :) i would reccommend this for people who do stress out a lot and know they get acne from it.